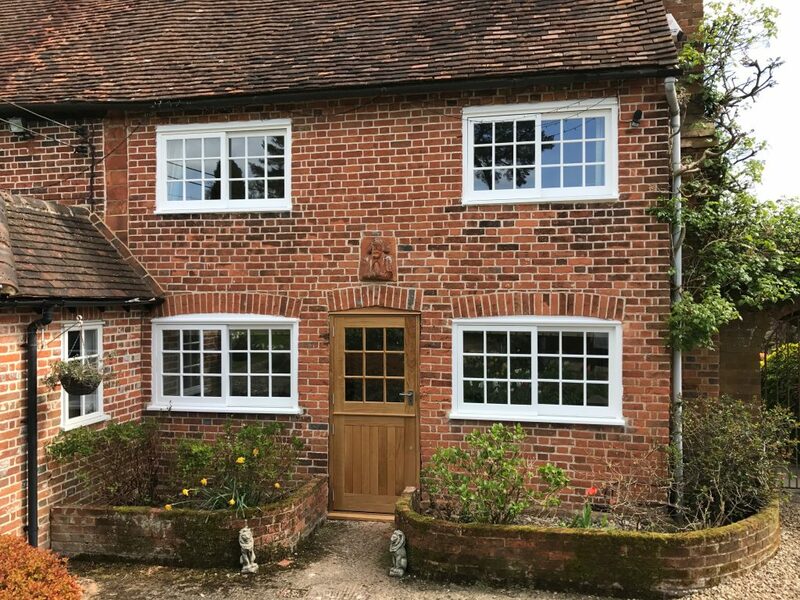 We were recently contacted by the owners of Red Lion Cottage in Amersham, Buckinghamshire to undertake some renovation work at their home. The property is a Grade II Listed Building, so it was imperative that any renovation work retained the property’s character and style. The project involved replacing all the windows and the entrance door with high quality timber alternatives. The cottage is now benefitting from secure and energy efficient windows and a stylish new door, and has lost none of its traditional charm. 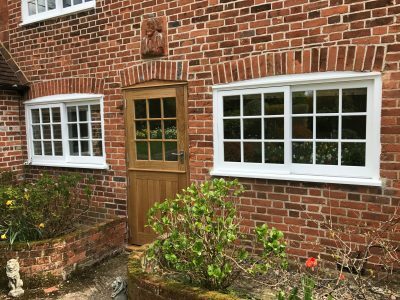 After discussing with the owners, we decided to replace the existing windows with traditional Yorkshire sliding sash windows and heritage Slimlite double glazed units. The windows feature astragal bars which perfectly replicate the original aesthetic. They function on a horizontal slide system for an easy action and wide opening capacity. The heritage Slimlite units fit perfectly into the existing aperture without any need for altering the property’s construction. The door was replaced with a European oak stable door also with heritage units. The owners opted for a varnished wood finish which tastefully accentuates the natural wood grain. They chose a stable door for its country cottage aesthetic and because this is what was originally installed when the property was built. The stable door provides excellent levels of security and ventilation capacity, and is perfectly in keeping with the cottage’s design. At Kirkman Joinery, we offer timber joinery services to meet almost any specifications. From high quality office furniture to full scale home improvement projects, we have the skills and knowledge to add a personal touch to any installation. For more information about our products and services call Kirkman Joinery on 01494 461 116 or contact us online. This entry was posted in Case Studies by Kirkman Joinery. Bookmark the permalink.